That latter question was on my mind for months after launching Metorik. It, and customer suggestions, serves as Metorik’s heartbeat, providing a steady stream of actionable and realistic features to add to Metorik. The biggest one that I couldn’t get off my mind was automated emails. Potentially one of WooCommerce’s greatest pain points presented itself as perhaps Metorik’s greatest opportunity. This was back in June last year. I hesitated, only for a moment, as until then Metorik had steered clear of interacting with its customers’ customers. It was not something I wanted to jump into unprepared. 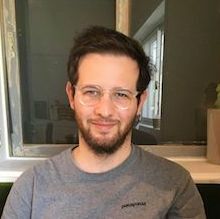 Sending emails is easy, but creating an automated email solution that felt natural to my users but at the same time provided them with the power & flexibility needed to get results - that was a challenge I was ready to acknowledge. But after discussions with customers and considering the bigger picture, I knew I had no choice but to build what would later be called Engage, and I’m proud to be launching it now. Its deep integration with WooCommerce. Its ability to perform at scale without impacting your store. As of today, it offers all the above, with a lot more to come. You can learn more about right here (or keep reading to see the whole story). Right now you can use it to send deeply segmented emails automatically. 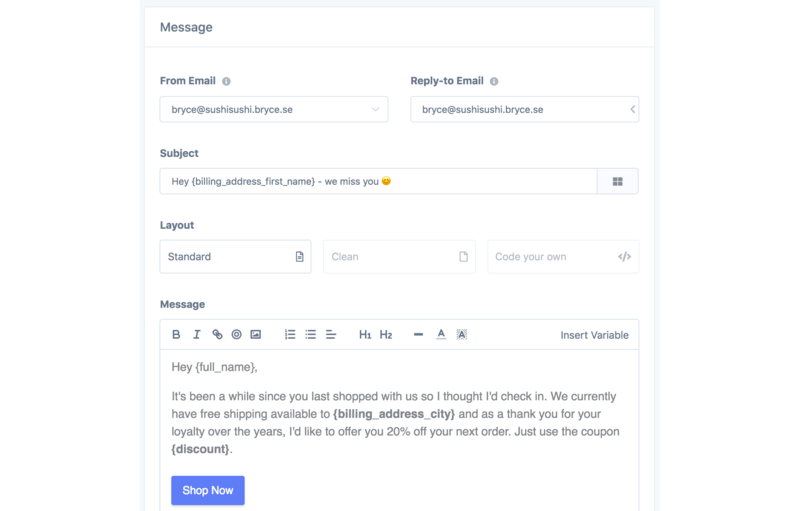 You can generate dynamic coupon codes in Woo that get included with every email sent. It boasts insightful reports that help you see which emails are winners and which need improvement. And its fast, with every email sent through our email provider Postmark, directly through your domain. 1. An audience (who should receive the automated email): As soon as an order, customer, or subscription belongs in the defined audience, they get the email. 2. A message: Composed directly in Metorik with a simple interface that any one on your team can use, you can use variables (like a customer’s name, an order’s payment method, or even custom meta), output components (order item table, product review table), and generate dynamic coupon codes to be included with each email. Email customers who have made more than 2 orders before but haven’t ordered in 180 days with a discount code asking them to come back. Email one week after an order is made to follow-up and see if everything’s ok, or perhaps ask for a product review. Email subscriptions 2 days before their next payment with a heads up. Email customers an on-boarding series when they purchase a certain product, spread out over a few automations sent days apart (here’s a guide showing you how to do just that). Metorik’s integrated Engage automation tools has been transformative for my WooCommerce stores. What makes Engage different is that I can build email automations directly tied to my customers behaviors and details with a level of intelligence I’ve never had access to in any other tool. Engage is incredible. It's exactly what we (& Woo) have needed. For some reason Metorik is literally one of the best things I've ever used.. I can feel the experience behind the development. Most things I use have problems at first but Metorik has always just worked flawlessly for me. Now, an important thing to note that doesn’t really come as a surprise to store owners, is that emails, and the resources needed to power and develop something like Engage, cost money. While I could have included it with Metorik’s existing plan, it would have been a foolish mistake and done much more harm in the long-run, as it would have jeopardised Metorik’s sustainability. Additionally, Metorik’s core product - pretty much everything it has besides Engage - is universally valuable to every store that uses it, so it makes sense to include it all with the core plan. But Engage, while I have no doubt it can provide value to every WooCommerce store in the world, is not something that every store will adopt. Many stores already have their own existing systems in place or aren’t interested in sending automated emails. So that leads me to my next point. 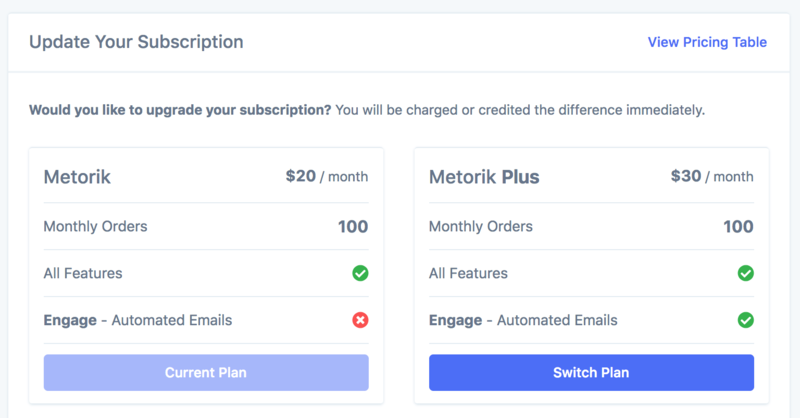 Engage is part of a new optional plan available today for Metorik - Metorik Plus. Automated cart emails - update: added! Broadcasting (easily send a one-off email to a custom segment - technically possible now but takes a bit of effort). 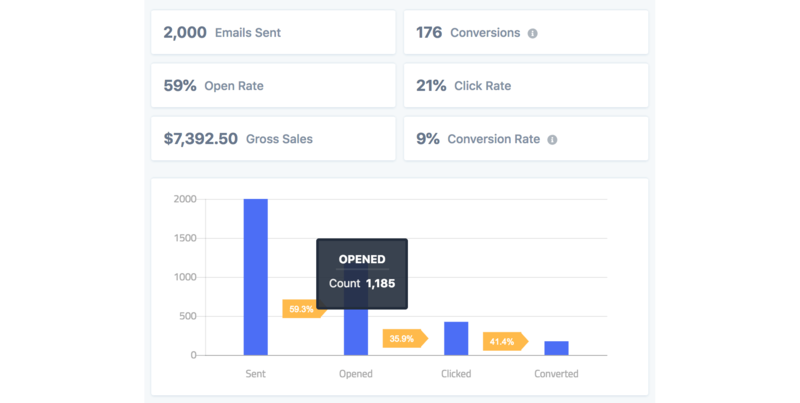 Sending individual emails to customers one-by-one through the dashboard. Send emails to a custom address instead of customers (eg. you could make an automation to flag potential fraud orders and have Metorik email you the moment one comes in). Custom templates for your team to re-use when creating automations (custom HTML is already possible but this will enable you to create re-usable HTML templates that team members can use without touching code). More variables & components for using in messages. Metorik's latest feature gives you the tools to build a completely custom dashboard for your WooCommerce store. One of the cooler things about WooCommerce (and WordPress) is the ability to save custom meta for orders, customers, and subscriptions.